This set of 3 Genuine Blueair 500/600 Particle Filters fits the 501, 503, 510, 505, 550E, 555EB, 601, 603, 605 and 650E Blueair Air Purifiers. Blueair recommends changing these replacement filters every 6 months. Units come with one HEPASilent filter kit (installed). One complete set of replacement air filters includes 3 particle replacement air filters that remove dust, pollen, bacteria, pet dander, mold spores and other airborne particles. The particle filter is made of polypropylene, which mechanically filters out airborne particles. To maximize filter effectiveness, particles are negatively charged before reaching the filters. These replacement air filters are also partially composed of activated carbon which helps remove odors and gases. Keeps our Blue Air in top shape. Great site, fast service and the best price. .
We order these replacement filters every 6-8 months. They do a good job cleaning the air. Appreciate the fast delivery by this company. 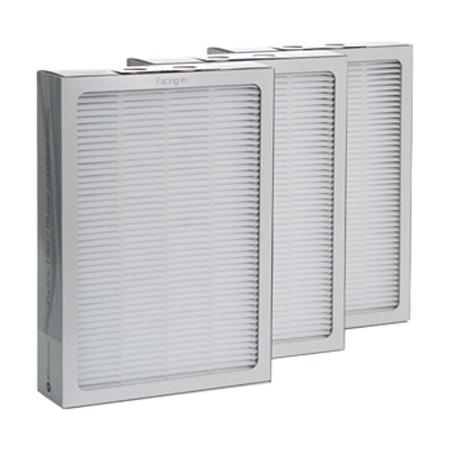 We've used your filters for several years to fight seasonal allergens. They work well and are easy to replace. Thanks for providing speedy and correct replacements at a good price. My Blueair filters were shipped quickly and arrived in perfect condition. This free-standing HEPA filter system really helps out with my seasonal allergies. The Blueair HEPASilent-Particle-Filters are the best. This company provided excellent service and promptly responded to questions. The delivery was prompt and the packaging was immaculate. Great company to order all kind of filters. I love the Blue Air air purifier, and these filters are affordable, unlike my other air purifier. I recommend them! BlueAir filtration systems are second to none! These Particle filters work very well. I have had my system for 2-3 years, and have seen a big change in allergy symptoms while in the house. BestFilters.com shipped them to my home a day or 2 faster than I expected...FOR FREE! Excellent product and highly effective--does what it is supposed to. The best price/ shipping (free) and excellent quality of Blueair.